Hayes’ Addison Harvey (3) soars in for a layup during the first half of Wednesday’s showdown against visiting Tri-Valley. 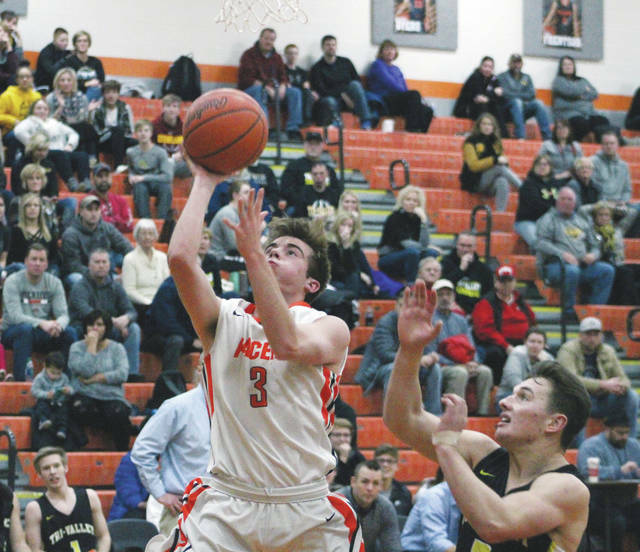 Dresden Tri-Valley used a 13-1 run in the fourth quarter and held off a late rally to hand host Delaware Hayes a 58-56 loss in the Larry Eberst Classic Wednesday night in Delaware. The Scotties (4-1) knocked down 11 three-pointers in the game, including five by Matt King. King and Jake McLoughlin each had 18 points in the win. “We had seen them on film and they hadn’t shot the ball nearly that well – so, hats off to them for knocking down shots,” Delaware coach Jordan Blackburn said. Terin Kinsway had nine points in the third quarter, including an and-one play to give the Pacers a 40-38 lead late in the frame. But, Delaware struggled offensively long enough for the Scotties to go on a run. Kinsway and Nate Griggs each went 1-for-2 at the line to give Delaware a 42-40 lead at the end of the third and Kinsway followed with another 1-for-2 trip early in the fourth to push the lead to three. That’s when Tri-Valley made its move. McLoughlin fed King for a three to tie the game before Greg Nolder found Jack Lyall for another one to give the Scotties the lead for good at the 3:34 mark of the final period. Griggs followed with another 1-for-2 trip at the charity stripe. Delaware finished 10-for-17 at the line for the game. Keaton Williams added a fourth triple before a Dow Cameron basket and two King free throws finished off the decisive run. Delaware trailed by as many as nine points twice in the fourth. But, Griggs brought them back with a basket and a three-point play before another Kinsway bucket cut the deficit to 56-53 with 0:26 left. A Kinsway three-pointer rimmed out which allowed Tri-Valley to ice the game. Delaware’s Harvey beat the buzzer for the final margin. Griggs finished with a game-high 21 points, Kinsway added 17 and Harvey chipped in eight for the Pacers (4-5). Delaware closes out the new year in non-league play at former OCC rival Mount Vernon Saturday night at 7:30 p.m.
Liberty knocked down four three-pointers in a 15-5 fourth quarter rally, but it came up short against Lake Catholic in the Wright Automotive Holiday Tournament at North Allegheny High School in Wexford (PA) Wednesday afternoon. Luka Eller had 26 points and Luke Frazier added 24 on the strength of four three-pointers to lead the Cougars (7-0). Mitchell Okuley knocked down a pair of threes in the run and Mitchell Kershner and Nick Nakasian each added treys of their own as Liberty cut a 55-42 deficit to four in the fourth quarter. But, that’s as close as the Patriots would get. Ryan Boruszkowski and Eller each followed with baskets before Frazier salted it away with four free throws after another Nakasian triple. The Cougars led by as many as 15 points in the first half, highlighted by an 11-1 run in the first quarter, before Liberty stormed back with an 8-0 run to close the first half down 32-25. The Patriots extended it to a 13-0 run with five quick Ben Roderick points early in the third quarter to close the deficit to two. But, Lake Catholic responded with a 17-6 run to close out the third. Roderick finished with 19 points, Kershner and Okuley added 10 apiece and Nakasian chipped in nine to lead the Patriots (3-4), who had their three-game winning streak snapped. Liberty faces Murrysville (PA) Franklin Regional, which lost to host North Allegheny at the buzzer, in the consolation game Thursday night at 6:30 p.m. The North Allegheny-Lake Catholic game will follow.